by Davies, Penelope J.E. ; Hofrichter, Frima Fox; Jacobs, Joseph F.; Simon, David L.; Roberts, Ann S.
Janson’s History of Art: The Western Tradition, Reissued Eighth Edition presents the same content as the text’s Eighth Edition, published in 2010, now reimagined for digital learning via Revel, and also available through the Pearson Custom Library. While remaining current with new discoveries and scholarship, the Reissued Eighth Edition maintains its focus on the object, its manufacture, and its visual character, and continues to consider the contribution of the artist as a key element of analysis. Throughout, the authors engage students by weaving a compelling narrative of how art has changed over time in the cultures that Europe has claimed as its heritage. Janson’s History of Art: The Western Tradition, Reissued Eighth Edition is also available via Revel™, an immersive learning experience designed for the way today's students read, think, and learn. For enrollments of at least 25, the Pearson Custom Library allows you to create your own textbook by combining chapters from best-selling Pearson textbooks and by adding your own content, such as a guide to a local art museum, a map of monuments in your area, your syllabus, or a study guide you've created. Priced according to the number of chapters, a custom text may even save your students money. Frima Fox Hofrichter is Professor and former Chair of the History of Art and Design department at Pratt Institute. She is author of Judith Leyster, A Dutch Artist in Holland’s Golden Age, which received CAA’s Millard Meiss Publication Fund Award. Ann M. Roberts, Professor of Art at Lake Forest College has published essays, articles and reviews on both Northern and Italian Renaissance topics. Her research focuses on women in the Renaissance, and her most recent publication is entitled Dominican Women and Renaissance Art: The Convent of San Domenico of Pisa. Anthony F. Janson forged a distinguished career as a professor, scholar, museum professional, and writer. 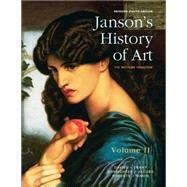 From the time of his father’s death in 1982 until 2004, he authored History of Art.